Henley’s senior men, junior girls, and junior boys squads were all represented at Wallingford regatta on Sunday 1st May, the first multi lane regatta of the season, held at Dorney and raced over the 2000m course. The sunny weather conditions at Dorney made for good racing, with a steady light cross wind not playing a major part. The first win of the day was achieved by the Junior 16 boys’ quad of Lachlan Reid, Cameron Jones, Bruce Turnell and Joseph Zolkwer. In the heat the boys got off to a good start establishing a lead of a length after the first 500m, they then worked steadily to hold off strong challenges from Llandaff RC and Wesminster School to maintain that lead and claim a place in the final. The final was a closer affair, with Llandaff being the strongest challengers again. For this race the crew from Llandaff worked hard in the first 500m to maintain a good overlap on the Henley crew, who responding to the challenge put in a fine performance to eventually win by a length in a time of six minutes and 41 seconds. The senior men’s squad of entered crews into the Challenge Coxless Fours and the Club Coxed Fours events, and Dave Read competed in the Challenge Single Sculls. All three crews qualified for their respective finals, with the highest placing achieved by the Coxed Four of Leon Redman, Andy Pettican, Peter Chartj and Nathan Hillier who finished a very tight third just 1.3 seconds in front of Agecroft in 4th place, who coming into the last 300m were just half a second down and challenging strongly for the place. Special mention must go to 14 year old Freya Reid who, whilst experienced in coxing junior crews, was coxing her first Senior Men’s race. The junior girls squad achieved wins in the Junior Eights, the J15 Coxed Quads, and the Junior Quads, and 2nd place in the J16 quads and coxed fours. The Junior Quad of Georgina Robinson Ranger, Charlotte Orr, Ella Morgan, and Lauren Kay beat local rivals Shiplake Vikings in their heat by just 0.7 seconds, but in the final got off to a good start establishing a 2 second lead after 500m, going on to win by just over 4 seconds in a time of 7 minutes 12 seconds. The J15 coxed quad of Sophia Hahn, Caoimhe O’Donohue, Amelia Crick, and Felicity Parfitt, coxed by Emeline Warner were comfortable winners of their event, beating Headington School by a margin of 10 seconds. 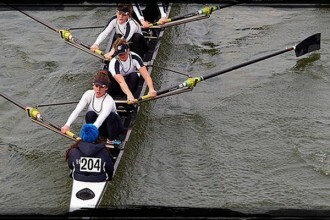 Bank Holiday Monday 1st May saw the other sections of the club racing at Marlow Spring Regatta. The event is held over a 1000m downstream course, with crews racing three abreast on a course with some gentle bends, making good steering a factor in closely fought races. Conditions of the course were difficult towards the later stages with a strong tail wind making conditions choppy over the last 250m. The club entered 35 crews across age groups from J13 to Masters E and achieved 12 wins, with a further six crews in 2nd place. The J13 and J14 squads won the boys and girls coxed quads in both age groups, with the J13 boys also winning the double. The J15 boys coxed quad of Balthasar Issa, Henry Peters, Tom Crook, and Oliver Taylor, coxed by Sam Bell completed a good weekend for the junior boys, winning their event over perennial rivals Windsor Boy’s School. 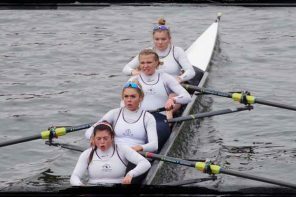 The girls J15 coxed quad of Bobbi Miles, Phoebe Fletcher, Jessica Arlett, and Esther Morgan, coxed by Freya Reid completed a clean sweep in the junior coxed quads events. Two crews achieved a notable milestone in their rowing career by winning their novices events. 18 year old Ross Taylor won novice singles, and Debbie Mason and Sevim Gencer, from the women’s master’s squad, won the Women’s Novice Doubles event, beating crews from Eton Excelsior and Kingston Grammar School. Debbie and Sevim are recent graduates of Henley’s Learn to Row course and were pleased to have won at their second attempt, in what was a closely fought battle from start to finish. 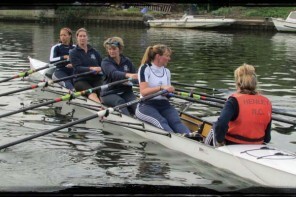 The Woman’s Masters E quad of Valerie Bennett, Linda Thomas, Helen Knowles and Helen Turnell completed a good day for Henley with a resounding win over Marlow rowing club and Walbrook. The Woman’s Masters crew were nearly joined in the list of wins by the men’s Master’s D quad, who having got off to a quick start establishing a half length lead over a crew from Maidenhead after the first 10 strokes, held onto that lead for 950 meters until the last 10 strokes, when the Henley crew caught a crab in choppy water and the positions reversed, giving local rivals Maidenhead a narrow victory. This weekend was the first full weekend of regatta racing for most of the squads from Henley Rowing Club, and the good results show that all the squads are in a good position at the start of the season. Next weekend the Senior Men’s squad and the J17 and J18 girls’ squad will competing at Ghent International Regatta against crews from across Europe and are looking forward to a busy weekend of racing.